Doctors were running tests Sunday. Egan was awake and alert. Doctors were unclear what his problem was, but Church officials said the situation was not serious. Egan did not attend his last Palm Sunday Mass in New York this morning. Bishop Dennis Sullivan celebrated the service in his place. On two related notes, Bishop Frederick Campbell of Columbus underwent surgery last Monday to remove his left leg due to complications of skin cancer and a bone infection, while word from the Diamond State says that Uncle Mickey -- Wilmington's recently-retired Bishop Michael Saltarelli -- is resting up following an emergency quadruple-bypass performed on Thursday. For these and all those suffering through this Holy Week -- whether in body, mind or spirit -- let's send up some especially good words over the coming days. The Cardinal is awake and alert, and his stomach pains have decreased. He expressed his disappointment at not being able to celebrate Palm Sunday Mass at the Cathedral of Saint Patrick. Egan's next scheduled Holy Week appearance is the Big Apple's Chrism Mass on Tuesday night in St Patrick's, where the archbishop traditionally leads all the major liturgies of these days. 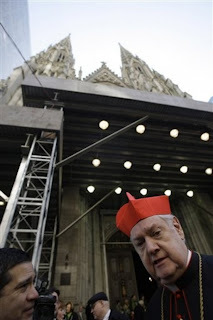 According to his spokesman, the cardinal is expected to be released from St Vincent's a day after the procedure. The 77 year old's presiding schedule for the remainder of his final week in office will be decided with his doctors following tomorrow's operation. After further consultation with his doctors, the pacemaker implant for Edward Cardinal Egan has been temporarily postponed. The pacemaker will not be installed on Monday, April 6, as was announced earlier today. The doctors explained that for the Cardinal the implant was not an emergency procedure, and could wait until his stomach ailment had improved and he has an opportunity to regain some strength. Decisions about the Cardinal’s participation in Holy Week services will be made when the Cardinal is feeling better and with the input of his doctors. The surgery to implant the pacemaker will be scheduled for a later date.